122 min. Paramount Pictures. Director: Mikhail Kalatozov. Cast: Sean Connery, Claudia Cardinale, Hardy Kruger, Peter Finch, Massimo Girotti. After 46 years in the Russian film industry, Mikheil Kalatozishvili ended his career with Krasnaya palatka, a.k.a. 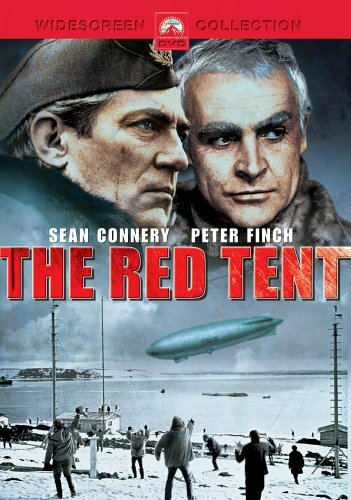 The Red Tent, an unusual and rich blend of epic film and memory play. The subject is the disasterous 1928 crash of the dirigible Italia, captained by General Umberto Nobile. In lengthy flashbacks from the vantage of his Roman apartment in 1968, the lonely Nobile recalls the tragedy. An insomniac, Nobile does not stop at regularly second-guessing his past actions: he appoints the ghosts of the dead to be his judge and jury. On the face of it, Nobile's expedition had more to do with national and personal pride than scientific exploration. Though Robert E. Peary had already won the race to the North Pole—and Norwegian Roald Amundsen first claimed the South—Nobile (Peter Finch) would be the first to land an airship at the Pole. The media happily flogged the story, which grew to unexpected proportions when the Italia succumbed to inclement weather, headed for home base in King's Bay, then crashed miles from safety and, at least immediately, out of radio contact. Facing two million square kilometers of search area and believing the cause lost, the Royal Italian Air Force is slow to action. In the early going, the tale focuses on the limited but deceptively simple choices of the crash survivors, some unharmed and contemplating a 50-mile march, others nursing broken limbs, snow-blindness, or hypothermia. Polar bears offer an alternative to pemmican rations, and a busted radio gives its operator, Biagi, a task to fill intimidating hours. As days and weeks pass, a mercenary aviator named Lundberg (Hardy Krüger) and the great Amundsen (Sean Connery) resolve to find any unlikely survivors (Connery is top-billed, but his appearances are brief). Kalatozishvili's recreations make convincing use of sets, locations, and effects to evoke the Arctic, the flight of the Italia, and the rescue operations, with icebreakers and planes braving what may be the harshest weather on the planet (though DVD reveals the presence of wires in the modelwork of a crash sequence, it's unlikely that they would have been visible in theatres or previous home-video editions). Despite its G rating (and the survival of Nobile's dog Titina), The Red Tent dramatizes moments of emotional intensity in keeping with the requisite hubris, folly, and noble sacrifice of a polar-disaster plot. The crash sequence is a tour de force, spilt red paint mingling with blood and a ruptured keelson and its human complement blown away like a kite. As the days go on, sacrificial suicide is a given. The script by Ennio De Concini and Richard Adams has a number of highlights. Though a nurse named Valeria (Claudia Cardinale) is one of the film's few inventions, she shares one of the film's most effective dramatic scenes, as she goads Connery's Amundsen to join the rescue effort. "Human beings have no business in the Arctic," he concludes, but he goes anyway. Amundsen's rivalry with Nobile (the two participated together on a 1926 journey to the Pole) is unspoken but obvious. Amundsen comes across as a true leader, while Nobile's choices remain cloudy. Kalatozishvili (credited on U.S. prints as Mickhail K. Kalatozov) gets strong support from cinematographer Leonid Kalashnikov, shooting in the rare Russian 70MM format Sovscope 70 (see also Akira Kurosawa's Dersu Uzala), and premier Italian film scorer Ennio Morricone. Some moments are dated, like Cardinale romping in the snow with Martsevich before he leaves on the mission, and the looped dialogue is distracting, but Kalatozishvili's spirited account of history is mostly unimbellished. In real life, Amundsen apparently thought little of Nobile, but the Norseman's ghostly absolution of the "defendant" can be interpreted as the hallucinatory self-justification of Nobile or even the polar explorers' mutual rationalization of their selfish pursuits of glory. De Concini and Adams also discard the distinct possibility that Malmgren was finished off and eaten by his travelling companions, and the closure between Nobile and his ghosts would have been better served by more moral ambiguity. Nevertheless, The Red Tent offers a dramatic look at the "emptiness, loneliness, beauty, [and] purity" of polar exploration. This TV staple gets a lovely anamorphic-widescreen transfer that's more than acceptable given its age. The colorful and detailed image is slightly cropped from its 2.20:1 original aspect ratio (apparently, this represents an improvement on the initial international theatrical release, which IMDB reports to have been cropped to 1.66:1), but not noticeably and the clean print shows only occasional scratches. A mastering glitch has resulted in an unfortunate issue. The few moments of Russian dialogue do not automatically display subtitles. To see the proper subtitles for these scenes, press the subtitle button on your remote. Press it until you see "English." Though the DVD presents the customary 122-minute "international cut," no effort has been made to offer the contemporaneous 195-minute director's cut of the film. Not surprisingly, then, no bonus features are included on this disc, but as a part of Paramount's budget catalog line, it's still a good value and well-worth owning. All site content © 2000-2019 Peter Canavese. Page generated at 04/18/2019 03:04:06AM.